These are DELICIOUS. Anybody who agrees that cookies taste better pre-oven will agree with me that cookie dough bites are a snack directly from heaven. I love the combination of chewy, sweet dough with rich chunks of chocolate embedded within. 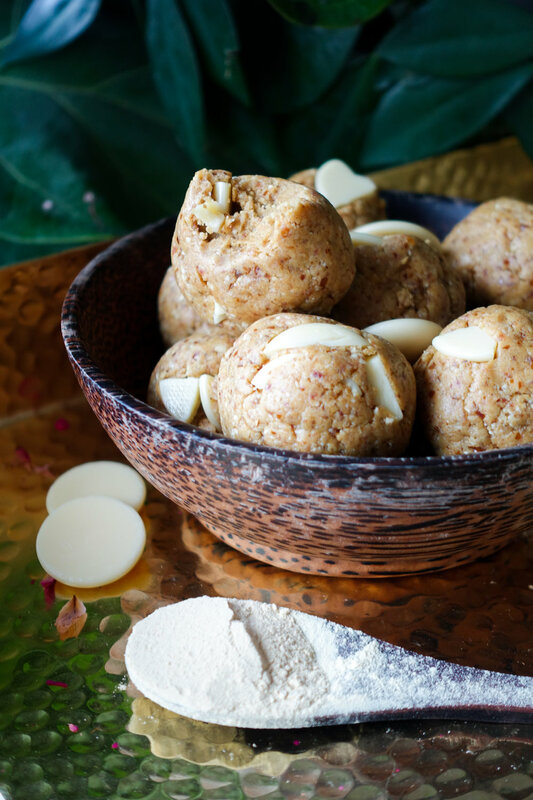 The best part is that these balls of goodness take just 10 minutes to whip up, from beginning to end, excluding dishes (and wiping up that pesky protein powder cloud that always seems to disperse itself across the kitchen). As opposed to traditional cookie dough within which you might find a combination of highly refined white sugar and slightly more virtuous brown sugar, these bites are sweetened entirely with the mineral-rich goodness of Medjool dates (or regular pitted dates, if you're after a cheaper option) and the protein powder. Additionally, the fats from the cashews mean that you'll feel more satiated than simply consuming dough high in carbohydrates. No pesky sugar rush from these delicious morsels! It includes vegan probiotics (more specifically, 100,000,000 CFU of Bacillus Coagulans). It includes extra goodies such as Matcha Green Tea, African Mango, Garcinia Cambogia, Raspberry Ketones, L-Carnitine and Green Coffee Bean. They use organic, sustainable and fair trade ingredients where possible. They're an equal opportunity employer. They use 100% renewable energy to produce their proteins. They use only natural flavours and don't have any preservatives, colourings or random additives. If that isn't enticing, I don't know what is! If you are interested in getting some and live in New Zealand, I always purchase mine from Health 2000. These balls are incredible snacks for on-the-go, or even pseudo-breakfasts if you're really in a rush. With 1/2 a cup of protein powder between them, a handful of these bites will certainly keep your energy levels stable throughout the morning - keep a jar in your fridge at all times for quick pick-me-up. Thank you to Health 2000 for supplying the PranaOn protein powder for this recipe. This blog post is NOT sponsored. I prefer my white chocolate chunks to be pure cacao butter as I find the dough itself plenty sweet enough, however if you prefer them to be sweetened you can either source vegan white chocolate OR melt your cacao butter and add 2 tablespoons of maple syrup and 1 tablespoon of coconut oil. If you have a powerful food processor, skip this step - soak your dates in warm water for 20-30 minutes. Place the oats, cashews, PranaOn White Chocolate protein powder and salt in the bowl of a food processor and blend until a powder is formed. This may take a while and require pulsing - get it as fine as possible for the most cookie-dough-like taste. Add the soaked and drained dates and the melted cacao butter, then blend until a smooth and sticky consistency is achieved. Finally, take tablespoons of the mixture and roll into bite-sized balls. I like to store mine in a jar in the refrigerator, but it's entirely up to you! They should keep for a couple weeks if so. Enjoy!